Twilly d'Hermes Eau de Parfum is the latest addition to my perfume collection. This Hermes gift set, that I received from my husband as our anniversary present back in August, comes in gorgeous box and includes Twilly d'Hermes perfume in full size and travel size. The packaging is so beautiful that it's almost intimidating to dislike it. The label describes this fragrance as floral, spicy, and oriental. Twilly d'Hermes was inspired by young, bold and unpredictable girl, But honestly, it smells kinda old fashionable for me. Number one thing that turns me off about any perfume is strong alcohol smell right after applying it because it gives me headache. Sadly, that's what happens when I apply Twilly d'Hermes. Alcohol along with ginger is so dominant from the first minutes that it almost makes me feel nauseous. After a few minutes, it dries down to powdery floral scent with little bit of spicesness. Eevn after that, I don't enjoy it, I guess, it's just not for me. 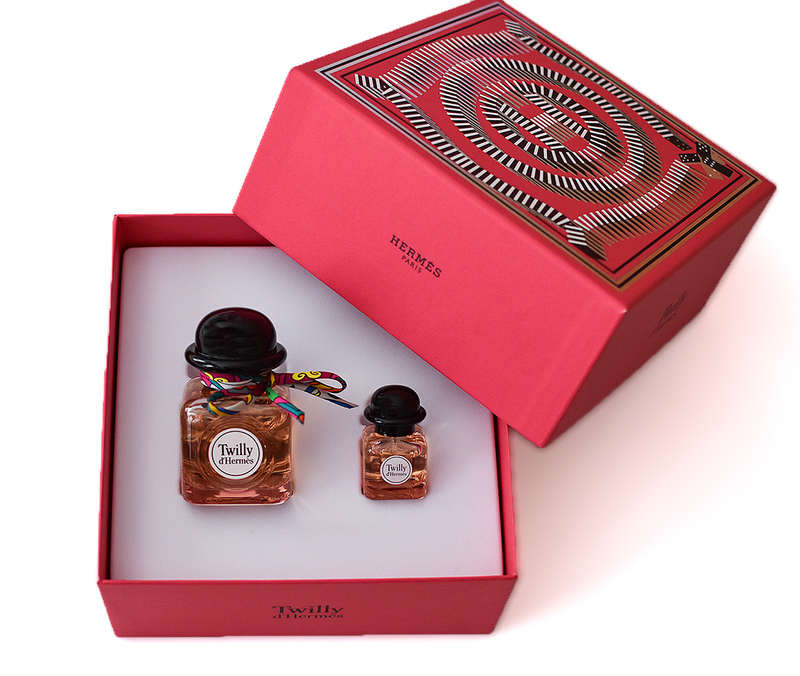 Longetivity is about 8-9 hours on me, which is great and the packaging, as you can see, is gorgeous __ the box is so beautiful and the full size bottle with a hand-tied silk ribbon is absolutely adorable. I really wanted to enjoy wearing this fragrance but unfortunately, it's not for me __ it's overpowering, with stong alcohol, and ginger note at the beginning. I love other perfumes from Hermes, especially Eau de Marveilles, that is my all time favorite fragrance, so I expected so much more from Hermes. If you love strong, bold scent, you might like this fragrance, in that case it will worth to spend $130 on it. 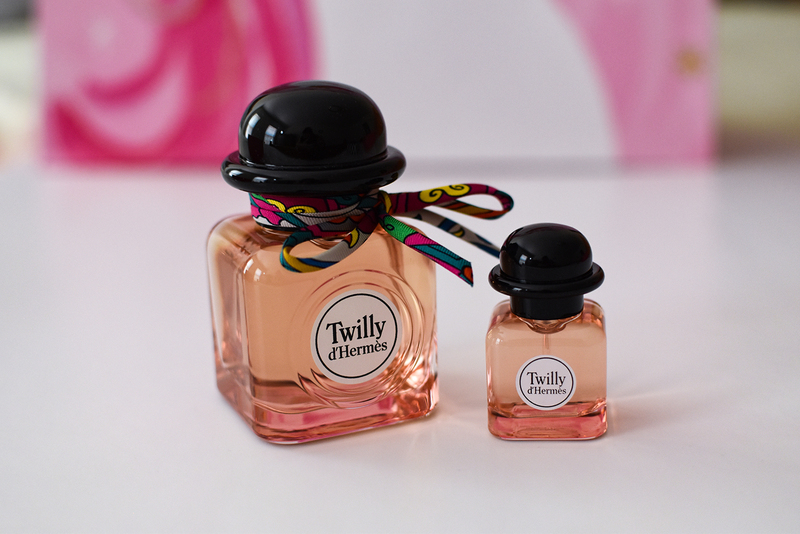 have you tried Twilly d'Hermes yet? Let me know in the comments below. I've never herad about this parfum but packaging is so cool! I know, packaging is really pretty, isn't it? Happy Monday dar. I think, that's what's going to happan haha. Happy Monday! what a nice review! Love the package! I adore this fragrance. When I smell it first time it was "love on first smell" and now I can't stop wear it. It is gorgeous. The packaging is stunning! Not sure I would go for a strong scent like this either. Thanks for sharing! Thanks Kathrine. Happy Monday dear! I'm sure the scent is very lovely, I haven't tried it yet. That packing is so gorgeous! You too, right? Yes, it was disappointing. This is new to me but I'm absolutely loving the packaging, it is so cute!!! Oooh, it looks so pretty! Great pictures too! This is such a cute packaging! Bummer you didn't love it! The packagin looks amazing. I love how cute this looks like. Wow, the bottle looks amazing! I have been wanting to try this one since it's release so found this honest review really helpful. What a pity this scent is not for you ... but the packaging is really beautiful! It's a bummer you weren't a fan of the scent itself, but you're right, the packaging is really cute! Lol. Have a lovely day! These are so cute! And thanks for your honest opinion (about the scent being overpowering). But they are still so cute. This sounds pretty nice to smell. The bottle is super adorable! Would love to have them even just for the bottles! I know, it is really pretty looking. I had a love hate relationship with this perfume and it became my favorite. It has the most unique sense and it is totally worth it. What a great gift from your hubby. I bet it smells so good. I love the packaging. The packaging is beautiful but that's too bad that it's not for you. I'm not a fan of really strong perfumes either since they give me a headache too. Thank you for being honest with the review! Thank you Kara. Me too, I don't like too strong scents. I never gave this one a try, but I remember when it was all over social media. I really hate the strong alcohol scent some perfumes have as well! Love this packaging!! Definitely need to sample this! sorry to hear it was not for you. The packaging is very pretty, though. it's a shame that you don't really like it! I love the packaging, it is so gorgeous, it's just a shame you didn't like the scent. What pretty bottles, but such a shame it didn't end up working out for you. I despise when such pricey fragrances are so high in alcohol!